$65 - 15 gallon 1" cal. JuJuBe Shanxi Li Self fertile, two inch round fruit, shiny reddish-brown, date-like with a sweet apple flavor. 150 hours $75 - deeproot pots 5/8" cal. Nectarine Red Sunset dwarf $55 - 7 gallon1" cal. $45 - 7 gallon ¾" cal. Peach Double Jewel richly flavored, yellow freestone $45 - 7 gallon 5/8" cal. Peach Early Amber yellow Semi-freestone, 300-350 chill hours, early-mid ripen, very juicy $45 - 7 gallon ¾" cal. Peach Sweet Bagel flat, yellow freestone , 300-500 chill hours $45 - 5 gallon ½" cal. Pear Florida Home $45 - 7 gallon ¾" cal. We carry a huge selection of size and varieties of fruit and nut trees. Availability and sizes change, we can not list every size and price here. Please email or call for specifics on fruit tree varieties, pricing, and sizes available. Patented varieties of anything are a little more. $35 to $49.95 in 3,7,15gl. Call for specifics and availability. Taste Test for peaches in our fruit tree selection. 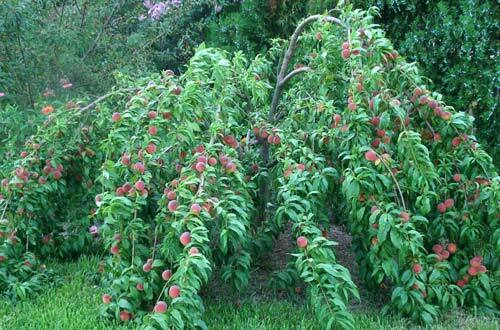 This is a peach tree at our friend's house. This peach is Tropic Snow. It's a demonstration on how good the peaches bore in 2010 due to the cold winter weather of 2009-2010. Its unusual to see any peaches load up with fruit like all of these did, in this area!